Observing the movement of clouds can provide a glimpse into how we can relate to mental activity more objectively, but it oversimplifies things when we take the analogy too literally. Clouds appear still when we're not paying close attention. If we hang out and watch them closely for a while, their steady, subtle shifts become more obvious. Similarly, our attention stays fixed on the meaning of our thoughts rather than on their minute fluctuations. It's possible, however, to temporarily shift the default emphasis away from the stories we're imagining in order to observe the constantly changing visual and auditory components of imagination itself. Mental images flicker and change. Mental chatter streams like a private podcast. If we take the cloud comparison as an instruction rather than a clarification, it makes it sound easier than it is. Unless we have extensive meteorological knowledge, what clouds mean remains secondary to our visual experience of them. It’s soothing to get caught up in the gentle way they move. But our mental images are familiar. Those private podcasts are personal and provocative. Clouds don’t ask: I wonder if I’m the worst? I wonder if I’m the best? Why does my life feel harder than other people’s lives look? Clouds don't say: I never seem to belong anywhere. Everyone can tell how nervous I feel. I have no idea what I'm doing. Clouds don’t continually broadcast poorly written TV shows based on our talents and vulnerabilities featuring a cast that includes not only us, our friends, and our families, but also our co-workers, celebrities, and mobs of angry strangers whose political positions are the complete opposite of our own. But our thoughts convey all of this without effort. Our attention tends to stay anchored in imaginary scenarios throughout the day. We think about our challenges while we brush our teeth, take a shower, and commute to work. We mentally replay memories and rehearse future conversations during boring meetings and slow-moving traffic. It's not possible to turn our thoughts off. But we can become so familiar with thinking itself that we're able to gradually transform the way we relate to our thoughts in real time. During any situation, you can disrupt the emphasis on meaning by closely observing a specific detail for a few seconds at a time. This includes sights, sounds, physical sensations, smells, flavors, and emotional sensations. It also includes mental images and mental chatter. This is simple to do, but it's not easy. It's a natural ability that requires practice to develop. Our attention effortlessly gravitates to making sense. Gently steering it back to sensing is what makes it exercise. Just as taking the stairs doesn't ever get easier than taking the elevator, observing our thoughts directly remains more challenging than going along for narrative rides. Both counter-instinctual efforts alter base-level abilities that we can only appreciate after we've exercised them for a while. Habitually taking the stairs makes our legs and hearts stronger. Habitually observing our thoughts (and feelings) leads to fighting with ourselves less. When we realize how challenging it is to de-emphasize the meaning of our self-referential thoughts, it’s easy to assume we’re either doing the exercises incorrectly or that we don’t have the ability to do them at all. 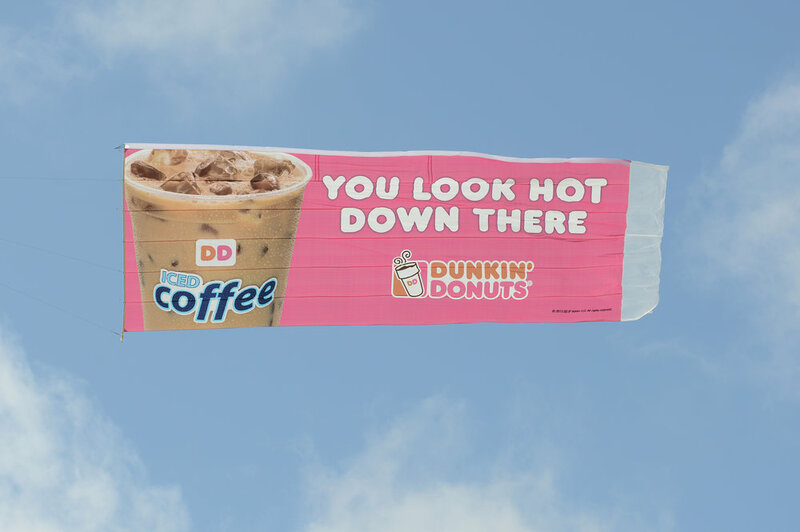 Maybe those airplane banner ads would make a better analogy for our thoughts than clouds. The messages that trail behind planes are designed to direct our attention to ways we might feel happier or more comfortable. What would it be like to briefly redirect our attention away from a specific message and toward the way the words flap in the wind? It's more challenging than watching clouds, but we can do it. It’s closer to what’s required in order to be able to see images gliding across our mental screens and to hear the rhythm of language buzzing through our internal earbuds. These tasks are even more challenging, but we can get better at them with training. Whether we're exercising our bodies or our attention, we have to find the right degree of challenge if we want to sustain our efforts over time. We have the capacity to let the meaning of our thoughts play out in the background of our awareness. We can take short breaks from making sense. We can let sensing be enough every now and then. We can find ways to become fascinated by the movement of our mental images and the oscillations of our internal conversations. We can learn to let the movement itself provide a deeper kind of meaning. As with any skill worth developing, we just have to practice doing what we can.